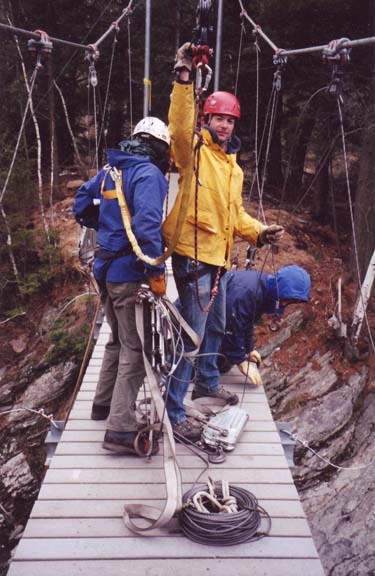 Top: Volunteers help build suspension bridge over Lamoille River. 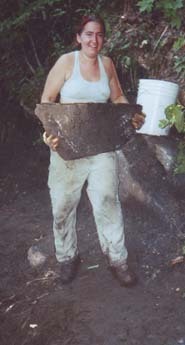 Second: Volunteer creates stone structures on the trail. 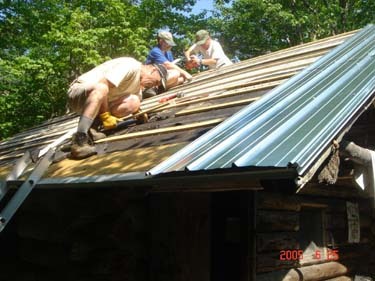 Third: Volunteers put a new roof on Beaver Meadow Lodge. 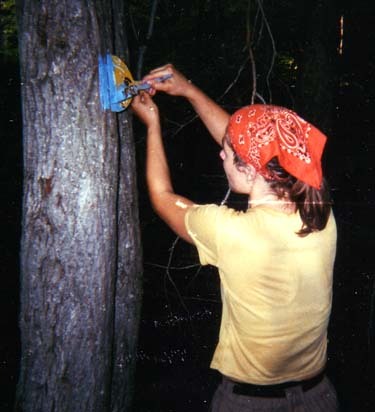 Bottom: Painting a blue blaze. We do a lot of trail work, and we like it. Some people say building the Long Trail is like building a cathedral - centuries of effort will be required, with skills passed from parent to child as each stone and timber is placed by hand . . . foot by foot . . . mile by mile. Others say it's like playing in a big sand box for grown ups. Either way, it's a good time and all are welcome! The work takes many forms. A variety to suit all tastes . . .
Every spring we spend a couple of weekends doing a walk through of all the trails - aka "the cruise." The first job is to cut out all the blown down trees that have blocked the trail over the winter. We also clip back the brush that grows into the trail each year. Finally, we keep an eye out for any larger special projects we might want to come back and spend more time on. Finally in the Fall we have a couple more large group weekends doing heavier jobs - digging erosion control dips on the trail, building stone stairs, etc. In addition to the trails, we also maintain the shelter sites . . . which leads to the most heroic act performed by GMC members - dealing with the outhouses, or as we prefer to think of it "safe and effective implementation of backcountry sanitation." "Work Parties" are convivial events and are moderately paced. You don't have to have any great strength or advanced skills to make a difference. We are always happy to teach new people. On the other hand, if you are already an experienced builder or woodsperson and are looking for a chance to really "sink your teeth" in a project - we've got lots you might enjoy as well!